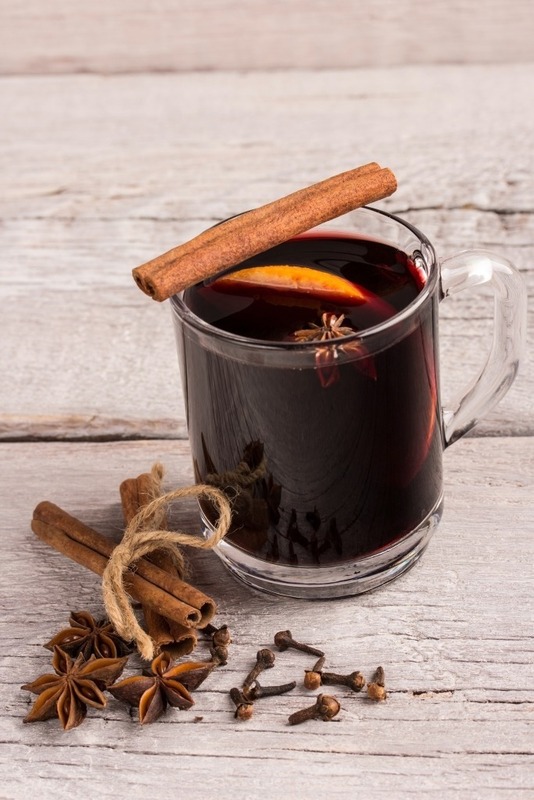 The scent of mulled wine drifting through the air is guaranteed to get everyone in the Christmas spirit. – In a large saucepan over a medium heat add the sugar, the lemon, lime and clementine peel, the clementine juice, bay leaves, cloves, cardamon pods, cinnamon stick and about 10 to 12 gratings of nutmeg along with the halved vanilla pod and stir in just enough red wine to cover the mixture. – Leave to simmer until the sugar has completely dissolved into the red wine and then bring to the boil. Keep the mixture at a rolling boil for about four to five minutes, or until its become a rich, thick syrup. It’s important to make this syrup base first because it needs to be quite hot (this makes sure the flavours from the spices are properly infused in the mixture). If you were to use all the wine at this stage you would burn off all the alcohol. – Once the syrup is ready, reduce the heat, add the star anise and the remaining wine and gently heat the wine. – Ladle this delicious drink into glasses and enjoy! This will give you enough for ten very happy guests.